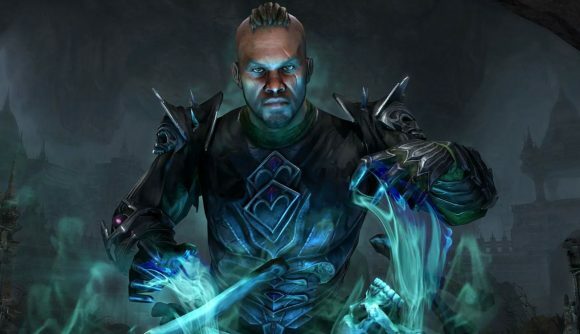 The latest expansion for Elder Scrolls Online is indeed Elsweyr, as the past weeks of datamines and teasers have suggested. The developers have officially lifted the veil on the game, and many of the details will be familiar if you’ve been following the leaks closely. We’re going to the Khajiit homeland, we’ll meet dragons, and we’ll have the chance to dabble in the dark arts with the Necromancer class. Elsweyr is part of a new year-long approach to storytelling called the Season of the Dragon. That starts with the Wrathstone DLC, continues through the launch of Elsweyr, and concludes through the third quarter dungeon pack and fourth quarter story zone. As the name implies, there’ll be dragons to battle – a first for ESO. The biggest addition is Elsweyr, the titular land of the Khajiit. The story will have the location invaded by Imperials and a Necromancer army on one hand while dealing with a dragon uprising on the other. Your main story quest will tie into the overall year-long story, and your explorations will give you a chance to dive into Khajiit lore – presumably clearing up any mysteries about how much coin you need to have before the feline merchants have wares. Necromancers form the other big contingent in this update. The new player class lets you bend death in unnatural ways, and most of the people of Tamriel aren’t fans of that. That means you’ll have to make cautious use of your abilities to avoid undue attention from guards. In addition to the flavourful cinematic trailer above, you can get a lot more specific detail in the Twitch stream archive. That includes info on some Sheogorath-fueled additions to PvP and teases for what content’s coming up in the smaller add-ons. The Elder Scrolls Online: Elsweyr is scheduled to launch on June 4. Expect plenty more details on everything the expansion contains in the months leading up to release.